Early in January of 2016 Rovos Rail purchased the Shongololo Express train of 19 coaches and agreed to employ all the personnel. “Operating a three-star train had always been at the back of my mind. When I learned that the Shongololo Express was on offer the timing seemed serendipitous and so an opportunity not to be missed”, says Rohan Vos, owner and CEO of the Rovos Rail Group, of the purchase. The train has been repainted in green and cream and an additional dining car plus an observation car have been added. The accommodation of six Emerald suites (± 10sqm) and 30 Gold cabins (± 7sqm) will remain as is. 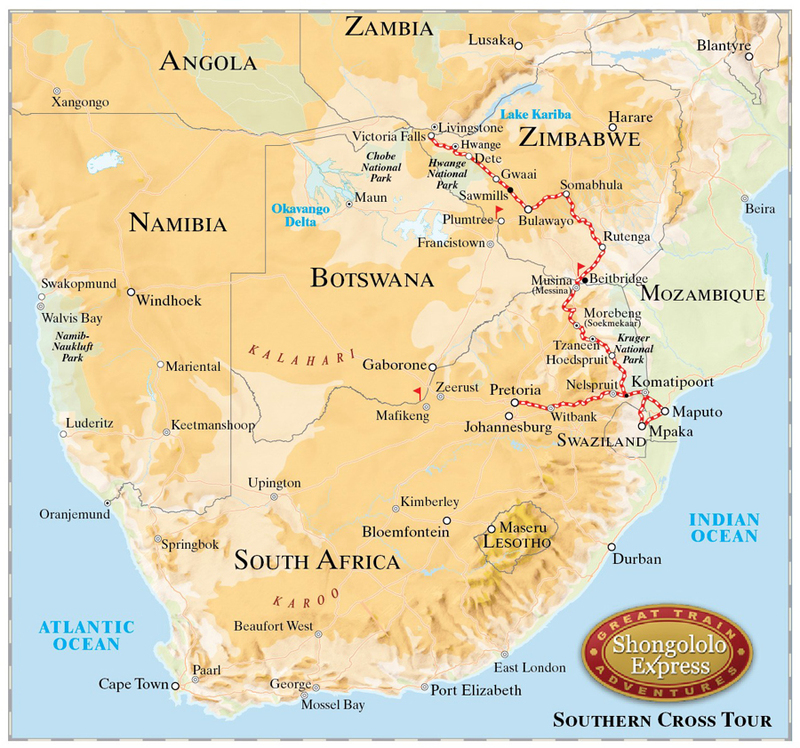 The three itineraries, Southern Cross – Pretoria to Victoria Falls (12 days), Dune Express – Pretoria to Swakopmund (12 days), Good-Hope – Pretoria to Cape Town (15 days); have been rebuilt with more stationary time at night and less road time spent on the excursions. Golf has been introduced to the Good-Hope trip, renamed Good-Hope Golf, with courses such as the Arabella Golf Estate, Ernie Els Oubaai, Fancourt, Champagne Sports Resort, Durban Country Club, Zimbali, Royal Swazi and Leopard Creek being available to guests. All journeys are available in reverse and, as before, guests can purchase optional extras that include visits to cultural, historical or heritage sites and overnight stays at safari lodges. The rates do not include most lunches, beverages and laundry. DEPARTURE DATES ARE SPECIFIC. Excursions may be changed according to schedule achieved. As the Shongololo Express uses the national railway facilities of Zimbabwe, South Africa, Namibia, Swaziland and Mozambique, the possibility exists that trains could be delayed, stopped or rerouted at any time. Daily activities could therefore be shortened, altered or cancelled. The Shongololo Express does not accept any responsibility for any changes to the daily programme. 08h30 Check out of hotel. Luggage collected by Shongololo staff. Tour of Pretoria or Johannesburg and Soweto. Transfer to Rovos Rail Station in Pretoria. 16h00 Train departs for Nelspruit. Gauteng is the economic power house of the Southern African region and home to some of Africa’s greatest cities. The name of the province is a Sotho word meaning “Place of Gold”, which is very suitable since much of the wealth of Gauteng has derived from this precious metal. Pretoria is the administrative capital of South Africa. We visit the Union Buildings designed by the famous colonial English architect, Sir Herbert Baker. Completed in 1913, it now houses the offices of the President and Ministers. The buildings overlook the city towards the once fortified hills to the south. A grand bronze statue of “Oom Paul (Kruger)”, the patriarch president of the ZAR or old Transvaal Republic, surrounded by his Boer fighters, dominates Church Square, at the centre of the city. Before leaving the capital behind, we visit the Voortrekker Monument, which commemorates the Great Trek of the 1830s. Comprising one million people, Soweto was made famous by the laws of Apartheid. We pass the Chris Hani Baragwanath Hospital (the largest hospital in the Southern Hemisphere) and also drive past the only street in Africa that once housed two Nobel Peace Laureates – Archbishop Desmond Tutu and Nelson Mandela. We visit the Hector Petersen Memorial, named after the first student to lose his life in the 1976 uprising against the Apartheid government. 09h00 Full-day panorama tour of Pilgrim’s Rest, Bourke’s Luck Potholes, God’s Window. 17h00 Rejoin train in Nelspruit and depart for Malelane. 08h00 Full-day game drive in the Kruger Park (open-air vehicles optional). 18h00 Return to the train in Malelane and depart for Mozambique. 09h00 City tour of Maputo, Mozambique. 15h30 Return to the train for afternoon tea. 18h00 After border formalities the train heads for Mpaka in Swaziland. 08h30 Depart in vehicles from Mpaka. Visit Ngwenya Glass, Mbabane and Manzini. 18h45 After border formalities at Mpaka, depart for Klaserie near Hoedspruit in Limpopo. 07h00 Morning game drive in Kapama Game Reserve followed by visit to the Wild Dog and Cheetah Project. 13h00 Return to the train for lunch. 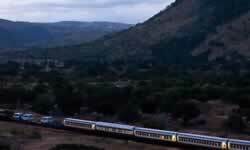 The train departs for Tzaneen with an overnight stop at Louis Trichardt. 09h00 Board vehicles and drive to the Great Zimbabwe Ruins. 17h00 Rejoin train in Bannockburn. 09h00 Full day at Antelope Park. Optional extras include canoeing, game drive, horseback game viewing, elephant-back riding, bird-watching cruise, walk with lions. 17h30 Return to the train and depart for Bulawayo. Wildlife abound in Antelope Park. Distance travelled: km. 09h00 Full-day tour of Matobas National Park. Visit the grave of Cecil John Rhodes as well as bushmen caves. 18h00 Return to the train and depart for Dete. 06h30 Game drive in Hwange Game Reserve. 18h00 Depart for Thompson’s Junction. 10h00 Arrive in Victoria Falls. Check out of the train and transfer to hotel. Luggage collected by Shongololo staff. 11h00 Walking tour of the village and Victoria Falls. 16h00 Sunset cruise on the Zambezi River. 18h30 Transfer back to hotel. Tour ends. Forming the largest single curtain of falling water on earth (on average the curtain is 92m deep), the Victoria Falls’ 500m plume of spray can be seen from as far as 70km away. The sound of the water can also be heard from kilometres away and up close this muted ‘thunder’ becomes a roar. In full flood, over 550 million litres of water per minute cascade over the brink. The vast width of the Falls, extending 1 708m, allow for many safe vantage points from where you will be able to get different views of the roiling water as it crashes into the gorge and whose constant spray maintains the rain forest. The forest is an attraction on its own with many of the trees marked to help identification. These include fig, mahogany, date palm, milkwood and ebony. The bird life is prolific and species that may be seen include the colourful sunbird and large trumpeter hornbill. Craft and curio shops abound with enough variety for everyone to find something to take home as a souvenir. Each train has its own bar, dining and accommodation carriages. As in any hotel, bedding and towels are provided and cabins are serviced daily. Cabins have ample storage space and closets are equipped with both hangers and shelving. Power is 220v AC and European plug adaptors are provided. In addition, there is an onboard laundry service.